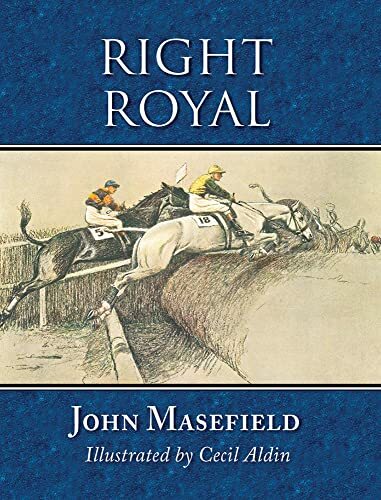 Synopsis: Right Royal is an irresistible racing ballad, written by former Poet Laureate John Masefield, about a dream which turned into a feat of madness: a vice familiar to many in the world of gambling! The poem was first published in 1920 and two years later a new edition was brought out, illustrated by Cecil Aldin. It has been out of print ever since. The action of the poem centres on Charles Cothill, the central character of the story, who enters his steeplechaser Right Royal for the English Chasers' Cup, a race with obvious parallels with the Grand National. It is run over four and a half miles and features formidable fences. Right Royal has earned a reputation for being ungenerous and temperamental, with remote prospects. But on the night before the race, Cothill dreams that the horse will win and the haunting line echoes throughout the poem: 'It's my day today--I shall not have another' The whole of the poem draws the reader in to the rash stake the young love-lorn jockey puts on his horse, and captures all the thrill of the races as the enthralling events of the day unfold. A tale of exhileration and heartbreak, folly and love, this is a spell-binding piece of flowing writing by one of Britain's finest poets. Cecil Aldin's fine illustrations beautifully capture the thrills of horse racing. About the Author&colon; Miles Napier is a former handicapper under Jockey Club and National Hunt Rules. He is the author of books on bloodstock breeding and racing. For over forty years a contributor to the Irish Field, he also wrote articles for The South African Racehorse, Owner-Breeder (California), Hoof Beats (New Zealand). He lectured at the National Stud, and is a member of the Elite Racing Club. Miles lives in Lincolnshire with his wife Mary.